Victoria, the capital city of the Canadian province of British Columbia, is located on the southern tip of Vancouver Island off Canada’s Pacific coast. Named after Queen Victoria of the United Kingdom and at the time, British North America, Victoria is one of the oldest cities in the Pacific Northwest with the British settling here in 1843. The city has retained some of its most historic buildings including its two most famous landmarks: the Parliament Building and the Fairmont Empress. The hotel sits on Government Street, facing the Inner Harbour. It opened in 1908 and is a designated National Historic Site of Canada due to its significance. This iconic hotel has played host to queens, kings, movie stars, and other famous people. In 2014, the hotel was sold to Nate and Flora Bosa. They invested more than $60 million in restoration including a spectacular new lobby and porte-cochère to welcome guests, a revitalized pool and health club, a renovation of Willow Stream Spa (listed by Conde Nast Traveler as one of the best spas in the world), updated guest rooms, and the addition of two new restaurants, Q at the Empress and Q Bar. If you haven't yet taken your kids outside of the United States, Victoria is an ideal place to start that adventure. When you visit, you'll feel the British vibe and hear both English and French being spoken. It’s a great way to get your kids used to traveling outside their comfort zone. The hotel offers several different options. There are 464 well-appointed, air-conditioned guest rooms and suites. Many of the rooms have stunning views of the harbor, city, and gardens. With a wide selection of unique guest rooms that feature classic details and modern luxury, no guest room is exactly the same as another at this beautiful grande dame of a hotel. We stayed on the second floor in a Harbour View Deluxe room. Our room had beautiful historic features that included original glass knobs on all the doors, a sitting area, and huge walk-in closet. My kids actually hung out in the closet, reading and playing games! We had a lovely view of the harbor, as well. For a few more dollars, I’d upgrade to a junior suite for our next visit. It gives you a privacy wall, so the kids can go to bed earlier than mom and dad. Room rates start between $239-$349, depending on the season and room type. Suites are more expensive. Summer is high season in Victoria. 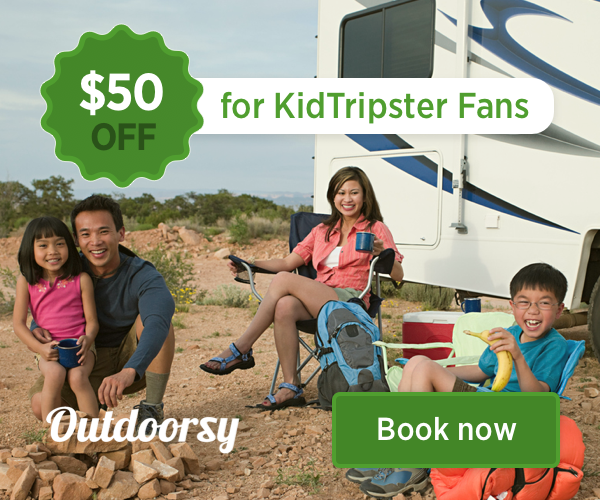 KidTripster Tip: Book the Let’s Take the Kids package. When you arrive, you begin with the scavenger hunt. Then there are two children’s robes waiting in your room with Empress children’s activity books, two Tigress the Empress Tiger stuffed animals, and a special children’s turndown service with milk and cookies (mom and dad can have some, too!). Children (ages 6-11) dine for 50% off when ordering from the regular menu. Children (under 5) eat for free from the children’s menu. This package also includes high tea at the Empress for the family with Prince or Princess Tea for children (12 and under). This offer is available year-round and starts at $580/night for a family of four. If you want to really indulge, choose the Fairmont Gold Experience. The Fairmont Gold was completely re-invented in 2017 and now has 65 beautifully-restored, luxury rooms and suites. The renovation also added the new Fairmont Gold Lounge and Terrace, which offers breakfast, snacks, an honor bar, and light canapés in the evening. 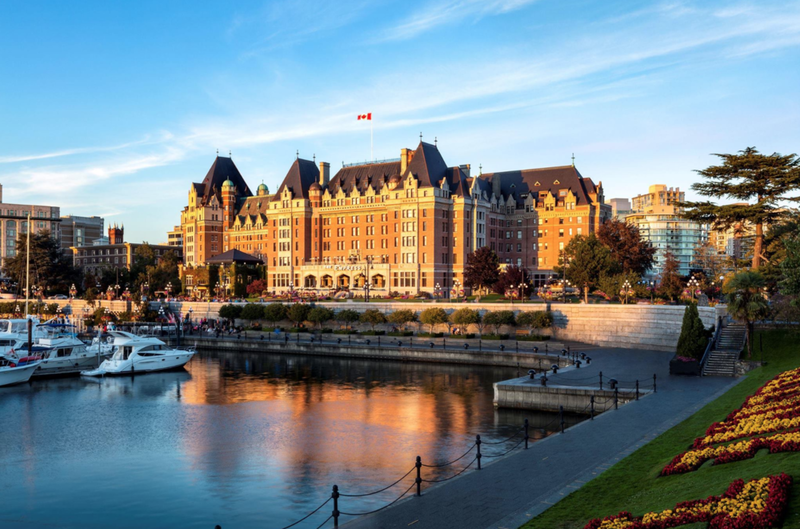 The biggest reason to upgrade to Fairmont Gold is the terrace; nowhere in the city of Victoria will you get better views of the Inner Harbour. Don’t worry, it may be fancy, but it’s kid-friendly, as well. We saw families enjoying breakfast when we visited the lounge. Rates are about $200 more per night if you book at this level. My family and I started our stay with the kids’ scavenger hunt in and around the hotel grounds. My kids loved the stop at the honeybee hives in hotel’s Centennial Garden. The hotel makes its own honey (which is delicious, by the way). It’s part of Fairmont Hotels’ bee sustainability program. My boys really enjoyed the newly restored indoor pool and spa area, too. It’s a big pool with a hot tub and toddler area. Right in front of the hotel, you can board the Hop-On Hop-Off double-decker sightseeing bus. This bus is a great way to get familiar with the city and see the sights with the kids. Our tour guide was a Victoria native and had some wonderful stories to tell (like the time he was riding a stationary bike at the YMCA and nearly fell off when he looked out the window and saw Queen Elizabeth getting out of a car across the street to attend church) along with lots of information about the city. Cost: Youth (5 and under) Free; Youth (6-12) about $11; Youth (13-17) about $21, Adult about $34, depending on the exchange rate. This pass is good for 24 hours, so it's worth the cost, especially if you have little kids who get tired from walking a lot. Beacon Hill Park is a must when visiting Victoria with the kids. There’s a petting zoo, playground, splash pad, and wild peacocks roaming the park grounds. Yes, you read that correctly, wild peacocks! My kids also loved our visit to the Victoria Bug Zoo (631 Courtney St.). It’s a hands-on museum of all-things-insects. My boys got to hold creepy crawlies, enjoying every minute of it! Cost: Youth (4 and under) Free; Youth (5-17) about $6; Adults about $9, depending on the exchange rate. A visit to Victoria wouldn’t be complete without a ride on the Victoria Harbor Ferry, or pickle boat as they’re called in this city. We took a leisurely ride around the Inner Harbour one evening, and at the end of the ride, the captain let my 6-year-old sit in the captain’s seat. It was a highlight for him. You catch the pickle boat at the Inner Harbour across from the Fairmont Empress. Cost: starts at about $4/person, depending on where you decide to stop. For the brave souls, take a ghost walk with Discover the Past walking tours. Victoria is known as one of the most haunted cities in the world. The nightly tour around town is fun, informative, and a little spooky. My 6-year-old didn’t last beyond the first stop, but my 10-year-old loved it and wanted to do the scarier tour later that night. Cost: Youth (6-11) about $6; Youth (12-17) about $10; Adult about $11; Family (parents + kids under 16) about $27, depending on exchange rate. Our favorite part of Victoria? Simply walking around this small, international city. Canada has two official languages, so every monument is in both French and English (so are the Starbucks coffee cups). My kids loved seeing and hearing the two different languages. There’s truly something magical about Victoria. I dare you not to fall in love with it! A tradition since 1908, Afternoon Tea at the Empress is a must-do. Served in the hotel’s historic Lobby Lounge, it’s an experience that you won’t soon forget. The hotel offers a special Prince or Princess Tea for children (12 and under). My boys weren’t fully on board with the whole idea when we arrived at the hotel because they couldn’t wear a t-shirt to tea. There is a dress code, so a buttoned-down shirt is required. Their misgivings disappeared when they were each served their very own trays of peanut butter and jelly sandwiches, turkey sandwiches, cookies, cakes, and other treats. My 6-year-old drank three cups of the speciality tea that the hotel makes just for kids! It’s worth every penny that you pay to enjoy afternoon tea at the Empress. Cost: Youth (under 12) about $30; Adult about $60/person. Each morning, we ate breakfast at the Q at the Empress, the hotel’s newly-renovated, full-service restaurant. The menu is farm-to-table with many of the ingredients coming from the hotel’s rooftop garden. My kids got the massive chocolate chip pancakes each morning and devoured every bite. Across the street from the Fairmont Empress is Dog Gone It (801 Government St.). My boys loved this quick and friendly hot dog joint. The favorite: the Husky Dog with melted jack cheese and bacon, steamed to perfection. It’s cheap, too, which mom and dad will like. We loved Red Fish Blue Fish (1006 Wharf St.) on the waterfront in the Inner Harbour. This eatery is an upcycled cargo container where you walk up and order. There’s outdoor seating on the wooden pier next to the container. The fried oysters, salmon fish and chips, and cod dog are a must. The portions are huge, so consider sharing. Every bite was delicious. For a meal that will leave you wanting more but too full to take another bite, check out The Ruby (3110 Douglast St.) at the mid-century modern Hotel Zed. Inside the small but cool interior, there’s all kinds of things to keep the kids busy from board games to a game room complete with a ping pong table. The food is incredible! It’s known for its signature rotisserie chicken, as well as breakfast tacos, poutine, and duck confit. Don’t worry, there’s a great kids’ menu, as well. KidTripster Tip: During the summer months, there are lemonade and ice cream stands all around the Inner Harbour. Make sure to stop at one and get a fun and affordable treat. Victoria is located on Vancouver Island and is the southernmost major city in western Canada. Unless you plan to explore the northern part of the island during your visit, there’s no need for a car while visiting Victoria. Most attractions are within easy walking distance or you can hop on a bus or water taxi. You have some options for getting to Victoria. Let's start with flying. From Vancouver, you can take a seaplane with Harbour Air. Advanced reservations are needed, as seating is limited. Cost: starts about $75/person/one way, depending on exchange rate. From Seattle, you can fly with Kenmore Air. If you want to skip a seaplane ride and add some luxury into your travel, try the posh V2V cruise that operates daily between downtown Vancouver and Victoria's Inner Harbour. Depending on what seating you choose, you can enjoy onboard perks like reclining leather chairs and a plated, three-course meal. It's a 3-1/2-hour crossing. Cost: Youth starts about $46/one way; Adult about $91/one way, depending on exchange rate. From Seattle, you can take the Victoria Clipper, a high-speed catamaran. It’s a walk on-walk off cruise that takes about three hours to Victoria’s Inner Harbour. Cost: $155/person/round trip. Journalist Gemma Gaudette is mom to two boys, ages 10 and 6 ½. (The half matters, says the 6-year-old) She loves to travel and is always planning her family’s next big adventure.